If you follow this blog or know me personally, you would know that I was injured in a serious accident. 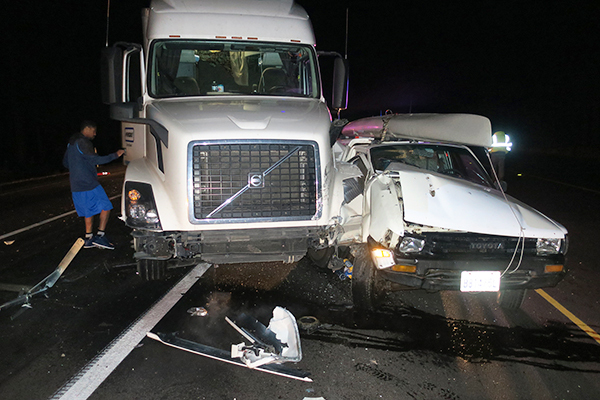 I was stopped for a flagman in a night construction zone on US 97 near Chiloquin, OR when I was rear ended by a forty ton semi truck doing 50 mph that did not even slow down. As you might imagine, I took quite a shot. I was knocked unconscious and could barely move. I had no broken bones, but a couple inches either way, both the flagman and I would have been killed. My truck was destroyed, most of the stuff in the camper was crushed. 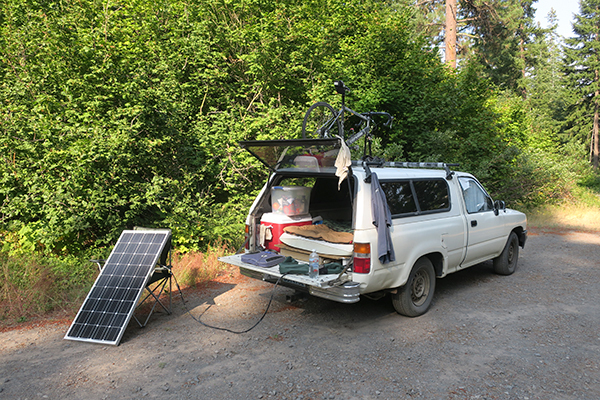 This is one of the last photos of the truck; 25mpg, solar power, equipped to spend up to a week off grid. 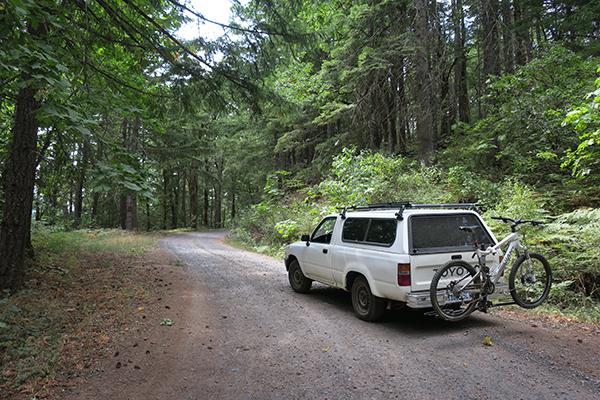 Here’s the truck on the last bike riding/camping trip on the mountain roads around Mt. Adams in Washington. To make matters worse, both my insurance company, Progressive Insurance, and the insurance company of the reckless truck driver, Gallagher Bassett, have refused to pay for any expenses resulting from the accident. I can’t say much more about this due to legal issues, but if you have either of these insurance companies, I beg you to go elsewhere. My life has been turned upside down, but I am working my way back. Number one is my health. I took a real beating in the accident. For about a week following the wreck, I could barely move. The worst injuries are to my back, neck, hips and legs, especially on the left side. While I suffered no broken bones, doctors have told me my ligaments and tendons are stretched and it will take a long time to recover. With no medical coverage from insurance and with all the financial fallout from the accident, I can’t afford any medical treatment so it is up to me to work myself back in shape. It’s been about three months since the accident, some of the soreness and pain has dissapated, but the majority of the pain in by back, hips and legs is still there. At times, it feels like my left leg is going to pop out of the hip socket. I have not had a complete night’s sleep since before the accident, those nights add up and start to have an effect on you. My rehab routine consists of walking, stretching and basic calisthetics to try and restore flexibility and strength to my lower back, hips and legs. I have not been able to ride a bicycle since before the accident and judging the progress I have made so far to regain fitness, I think it will be at least another two or three months before I am able to even try and ride a bike. I’ll be documenting my rehab process for anyone else who suffers similar injuries without having a pile of cash, maybe help them on what can be a long road back. That won’t be all that exciting, but I’ll be back with more mountain biking from great riding spots soon. Mountain bikers are used to being knocked down once in a while. We always get back on the bike.